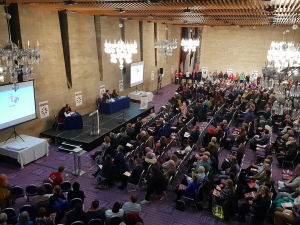 On Thursday 22nd November, at Newcastle Civic Centre, over 500 people gathered to hear the findings of the Tyne & Wear Citizens Mental Health Commission. It was an assembly where key requests were put to public figures to ensure commitment to change across the institutions they were representing. We had some fantastic Sixth Form students involved on stage all evening…. Rebecca Crow shared moving testimony to the VIP invited guests and challenged them to do something about the increasing strain on NHS services. Neave Miller, Alex Stephenson, Steph Potts, Rebecca Crow and Hannah Baldwin presented on our request that CAMHS work with students at St. Thomas More to re-design the clinic. They replied with an overwhelming yes. Former student Amy Cass, alongside Indion Chinna, Alannah Sweeney, Emma Malcolm, and Neave Miller presented on the request for mandatory provision of school counsellors in every school in England and some shared testimony of experiences from pupils of using school counselling services. They secured commitment from Catherine McKinnell, MP to take this issue to the governmental Health & Social Committee. She also agreed to pilot and evaluate the local provision that already exists. The students who were commissioners at the public hearings in June were also invited on stage to be formally thanked and presented with certificates. Rebecca Mould & Emily Whiting were the timekeepers and were present on stage through the whole assembly and made sure everybody kept to time. The students on the night were absolutely incredible, as well as all those who have been involved in the whole process to this point. Congratulations and well done to them all!